All Due Respect Issue #1 is Live! 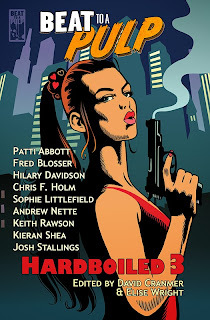 As the title says, All Due Respect, Issue #1 is officially live for Kindle, with a print version soon to follow. I'm honored to be their featured author; I contributed a brand new short titled "A Dying Art," sat down with Steve Weddle to talk all things writing, and also have the great pleasure of having my Collector series written up by the ever-incisive Elizabeth A. White. Throw in some great fiction from the likes of Todd Robinson, Renee Asher Pickup, Paul D. Brazill, Travis Richardson, Mike Miner, and Walter Conley, and reviews from editors Mike Monson and Chris Rhatigan, and you've got one hell of a debut. Get yours now! UPDATE: The physical copy is now available, too! "Reflect what you are, in case you don't know..."
Yesterday, Scott Montgomery posted a piece at the MysteryPeople blog about Lou Reed's influence on crime fiction. It's a topic near to my heart, because Reed and those who followed in his footsteps changed the trajectory of my life, not to mention my writing - which is why I was honored he asked me to share my thoughts on the topic. I'm in rare company; also featured are such stellar writers as Reed Farrel Coleman, Megan Abbott, Josh Stallings, Todd Robinson, and Lisa Lutz, just to name a few. You can read the piece here. "THE BIG REAP is about love and what tragic lengths people will go to save the ones they love. It’s a tragic story and a timeless one...While the narrative ends at a full stop, I wholeheartedly hope this wasn’t the last we’ve seen of Sam Thornton and friends as I just enjoy his character and the tone of the series so damn much. While THE BIG REAP can be appreciated on its own, if you haven’t read any of the books before, I strongly suggest you start at the beginning with DEAD HARVEST as not only will you get far more from THE BIG REAP, you’ll also be in for two fantastic reads. 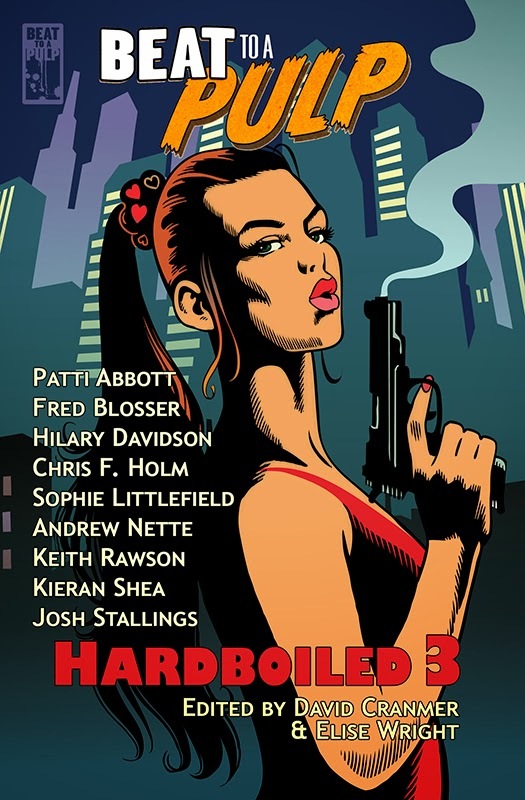 Whatever Chris Holm writes next, I’ll be there to read it..."
Today marks the release of BEAT TO A PULP: HARDBOILED 3, in both physical and e-book form. Once again, award-winning editor David Cranmer and company bring the goods, with stories from nine of the finest writers in crime fiction today. I'm delighted to share space with the lot of 'em. My addition to the collection is a brutal little tale called "The Follow-Through," which first appeared on Beat to a Pulp's site a few months back. To find out more about the collection, including purchase info, see what David has to say about it on his blog. Today, I'm over at the lovely and charming Vanessa Delamare's bilingual blogstravaganza, talking all things Collector (in English, thank God.) And in other news, the also lovely and charming David Cranmer has a sneak peek at a new project of which I am a part. Scott Montgomery of Austin's BookPeople was kind enough to shoot some questions about THE BIG REAP my way the other day. I did my best to answer them. If you'd like to check out our discussion, you can do so here. Tomorrow, I make my way inland to that mythical land of beer, cheese, and motorcycles: Wisconsin. Why, you ask? To which I reply, BEER, CHEESE, AND MOTORCYCLES. But also, the sheer bookworld joy that is Murder and Mayhem in Muskego. It's one of the best events going, and the talent it draws (with the possible exception of yours truly) is first-rate. If it isn't already on your calendar, it ought to be. Holm has amazing skill when it comes to emotion and theme. The book’s meaning creeps up on the reader, without one fully grasping it until the last sentence. The emotions build as Sam’s well earned cynicism gives way to a slight sense of hope, if not trust. To Holm, even Heaven and Hell aren’t black and white. I’d love to delve more into THE BIG REAP, but what is so good about it is tied to its impacting reveals that serve as more than just plot twists. Holm weaves the ideas he wants to explore with his story like a master craftsman. He uses the subtext of hard boiled novels, making the text through urban fantasy a starting point to venture in less charted territory. Scott's review is the kind that reminds me why I started writing in the first place. Thanks a million, man. Today, THE BIG REAP joins DEAD HARVEST and THE WRONG GOODBYE in getting the review and alternate cover treatment over at Blurb Hack; click through to see what Lorenzo cooked up for this installment. And at Just A Guy Who Likes To Read, the titular guy Josh takes a peek at the close of the trilogy as well. Thanks, gents, for the kind words. Today, DEAD HARVEST and I are the subjects of the inaugural installment of BOLO Books' new Inter(Re)view feature, in which review and book-specific interview are combined. It's a fun idea that offers potential readers insight into the book a review alone might not. You can check it out here.